The adventure-filled story of the legendary Hudson’s Bay Company is inextricably linked to the formation of a Canadian nation stretching from sea to sea to sea. 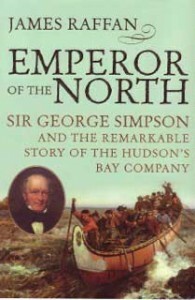 In an absorbing and lively new book on The Bay, James Raffan explores the forces that moulded a man, a company and a country.The histories of Sir George Simpson and the HBC in the golden years of the 19th century are in many ways one history, for Simpson’s professional acumen and personal ambitions propelled a failing business to a position of great wealth and political power. At its height, the HBC trading territory covered an astonishing one-twelfth of the world’s surface. Raffan captures the many contradictions of the larger-than-life man at its centre: a brilliant manager who kept an iron grip on his fur forts from east to west, ensuring British power across the land; a pompous dandy who was most at home in a voyageur-paddled canoe; a man ashamed of his illegitimate birth but who went on to sire 13 children with eight different women, only one of whom was his wife; a master businessman who laid the foundations for the single greatest business enterprise of its day. Emperor of the North is the vibrant tale of a man who shaped much more than a fur-trading company—he launched an empire of ideas that led to the creation of a country. Meticulously researched, highly readable and wonderfully illuminated by maps and archival photographs, Emperor of the North is a delight for history buffs, armchair adventurers and biography fans alike. I don’t agree with Peter Newman. I had no trouble wanting to finish it!